The country's best pizza is officially available in Fishtown again as the brand new Pizzeria Beddia opened to the public for dinner Thursday. Pizza master and owner Joe Beddia announced the opening on Instagram on Thursday afternoon, declaring the new restaurant, at 1313 N. Lee St., would be open with limited availability and some room for walk-ins. The new site is a departure from the famous hole-in-the-wall that sparked long lines and major headlines since 2015, where just 40 pies were sold a day on a first-come, first-serve basis, and with zero seats for customers to sit and eat. This restaurant not only has an airy dining room to sit and enjoy your meal, but you can even make reservations now. Pizzeria Beddia 2.0 alleviates the pizza making duties from Beddia himself, instead offering a trained kitchen staff creating not only Beddia's signature pies, but a more expansive menu with highlights like Cantabrian anchovies, sustainably sourced salumi, and espresso soft serve. The full menu is not yet available online. Beddia's original pizza shop closed last spring to give its owner a bit of a break and prepare for the newer, larger restaurant now open in Fishtown. 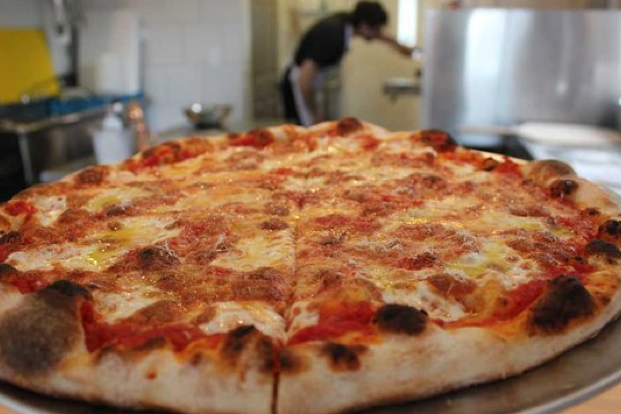 Check out the brand new Pizzeria Beddia site and start planning your pilgrimage.